“We’re simply in the business of showing the other side. We balance out mainstream media.” sez the Fox shill. Yep, that’s absolutely right, guys. You’re a bunch of liars and the “mainstream media” tells the truth. See, fair and balanced. Brent Bozell is the Conservative version of David Brock. He has his own watchdog group called the Media Research Center, which is looking for Liberal bias in the media and is also a tax-exempt organization. 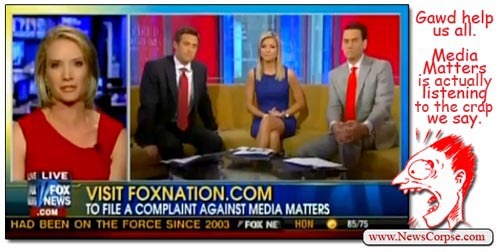 The irony of Bozell and Fox to complain about this is astonishing.